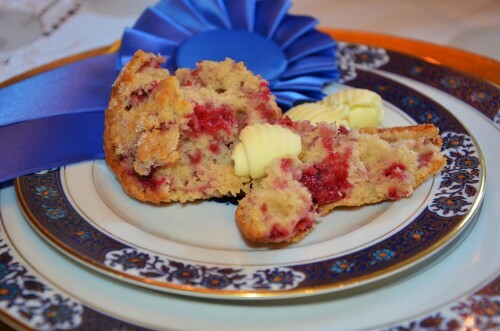 These muffins won the blue ribbon at the county fair without the streusel on top. I love them either way. If you don't do the steusel, sprinkle about a ½ of teaspoon of sugar on top of each muffin before baking to crisp the tops up. Also, if you'd like gluten free, substitute in McArthur Gluten Free Multi-Purpose Flour in place of regular flour and add a teaspoon of Xanthan Gum to bind it together. Cream with an electric mixer butter and sugar. Then add lemon extract, zest, and half and half. Mix in baking powder, salt and cinnamon. Briefly beat in flour just until mixed. Fill cups so they are crowned a little over the top, makes 11 good size muffins. Mix the sugar and flour together for the streusel topping, then cut in butter to make crumbles. 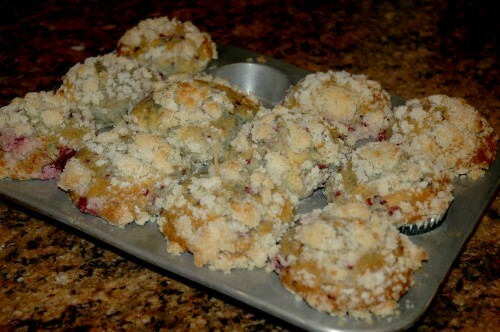 Divide mixture between the 11 muffins and sprinkle on top. Bake at 375 degrees F for about 35 minutes. Test with a toothpick. Serve hot with butter. For gluten free, I use McArthur Gluten Free Flour. You might have to add an additional ¼ cup flour to the 2 cups of flour to thicken it up for a whole batch. What is even better, use the regular amount of flour and add 1 teaspoon of Xanthan Gum. It is a thickener. You can find it in the specialty foods area of your grocery store. They turned out wonderful using this. Gluten free has a tendency to be crumbly, even more so if you are adding more flour. This took care of that and if you hadn't told me they were gluten free, I wouldn't have been able to tell!